Federal Reserve Governor Michelle Bowman will join ABA President and CEO Rob Nichols for a conversation on the current state of community banking at ABA’s upcoming Conference for Community Bankers, Feb. 10-13 in San Diego. Federal Reserve Governor Michelle Bowman will join American Bankers Association President and CEO Rob Nichols for a conversation on the current state of community banking at ABA’s upcoming Conference for Community Bankers, Feb. 10-13 in San Diego. The session will take place on Monday, Feb. 11, at 8:30 a.m. PST, and will be livestreamed. This will be the first public appearance for Bowman — who holds the designated community banking seat on the Fed board — since she joined the agency in late November. 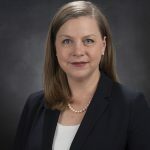 She is a fifth-generation banker who held a senior role at Farmers and Drovers Bank in Council Grove, Kan., for more than six years and also served as Kansas state banking commissioner.